The ‘more’ he refers to has become what the neighbours fondly refer to as ‘the hanger’. A bold structure, which despite its angular shape and strong exterior lines, has a simplicity that endears it to lovers of the unique. ‘A design like this doesn’t normally fit within the parameters outlined by a subdivision developer’, explains Jason. ‘The roofline, in particular, was well outside their rules; however, I noticed in the footnotes of their rules that alternative materials, roof pitches and the likes may be considered providing they do no not adversely affect the development.’ So, once they had obtained a ‘thumbs-up’ from the developer, construction on the home was able to begin. Like Jason, the Miles Construction team had been involved in the design and build of Bernie’s sister’s home. ‘We were very impressed with what the two companies had achieved there’, continues Bernie, ‘which gave us the confidence that they could, and would, achieve what we wanted’. Like many others involved in the property, Alastair Miles and his team were excited to be part of such an interesting and unique project. ‘It is a pretty cool home’, he enthuses. ‘While we are seeing similar shapes on the hill, the home is very different for its location, and we are immensely proud of what has been achieved. 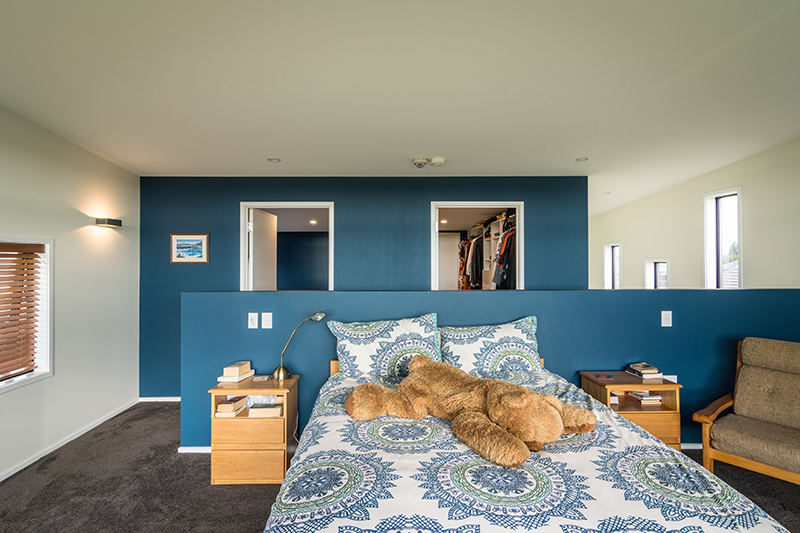 Despite having never built before the couple had done their homework and were prepared for the many decisions that came their way – which included selecting the perfect exterior cladding. A factor that saw them elect to use a product for their exterior walls that is normally reserved for the roof. Working alongside Miles Construction to achieve this unusual cladding request was CS Roofing Canterbury. As specialist installers in longrun iron roofing for the residential, commercial and architectural markets, they are no strangers to innovative design decisions, and relished being hands-on with this project. A bold structure, which despite its angular shape and strong exterior lines has a simplicity that endears it to lovers of the unique. ‘Bernie and Janet started the conversation about the roof and wall cladding with us in 2014’, explains owner Jenny Maxwell. ‘We then worked with them during the design and planning phase, right through to installation, to get it right. Reflecting the purpose of each part of the home, three separate roofing profiles work harmoniously to achieve a seamless finish. Euro-Tray Lite is utilised on the walls, while High Five and Solar-Rib are found on the roof. To contrast the dark textural element of the rest of the exterior, a Rockcote EPS40 Insulated Façade System and cedar paneling were selected to cover the entranceway and bedroom wing of the home. 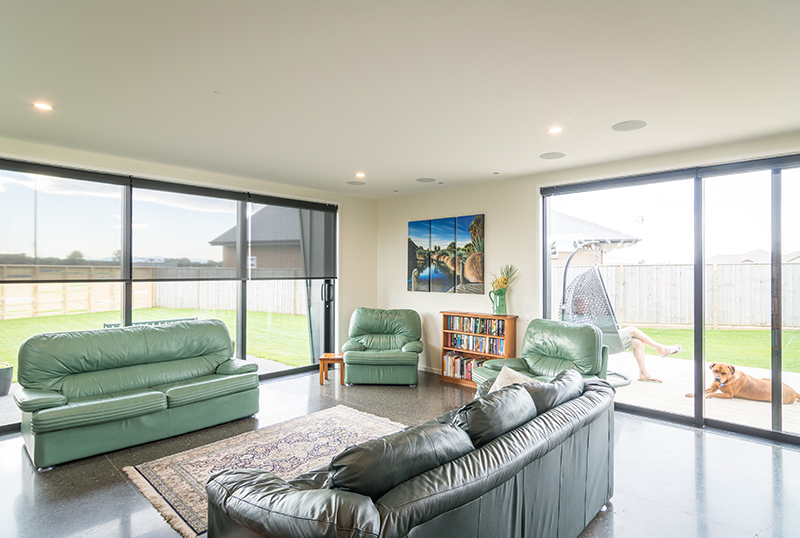 Views across pastoral land out to the Southern Alps aid the notion of being on holiday, and the interior colour scheme enhances it further. Regularly working alongside Miles Construction, painter Daniel Smith from Smithy’s Decorating takes pride in the ‘picture perfect’ finish his team achieves every time. Complementing the interior colour scheme is the addition of Godfrey Hirst Valley Charm solution-dyed polyester carpet in colour Charcoal. Found in private areas of the home, the luxuriously soft, deep-piled carpet was supplied and installed by Floorpride Mandeville Street. With a strong emphasis on service, Floorpride Mandeville Street helped Bernie and Janet to satisfy all their flooring needs. Floorpride are specialists in hard flooring as well as carpet, and Janet and Bernie enjoyed the ease of being able to source their bathroom wall and floor tiles from the same place, selecting Paris Nero tiles for the floor and walls, and Solar Midnight mosaic tiles as a feature. As the Drive Thru Manager at Mitre 10 MEGA Papanui, for Bernie it was a natural choice when it came to the finishing touches in the bathroom. While the vanities and tapware throughout the home are testament to the variety of high-quality fittings available, the Caroma Noir Freestanding Bath in the master ensuite is a standout – instantly igniting a sense of relaxation and luxury. With windows flooding the room with natural light and affording picturesque views, this is a tranquil space in which to escape at the end of the day. In contrast to its dark and bold exterior, the interior of the Cummings’ home is light and bright. Connecting the two levels of the home is a floating staircase. Fitting with the couple’s desire to achieve an open, light-filled interior, the single steel stringer timber tread staircase adds a textural element to the interior without overpowering it. A feat enhanced by the addition of a glass balustrade, designed and installed by Canterbury Balustrade. ‘The toughened glass is fully utilised and has polished edges to achieve clean lines and an aesthetically pleasing finish’, offers Director, Hamish Gillespie. Providing security and safety, the balustrade also acts as an enduring architectural feature designed to enhance the perception of space within the home. However it is not simply the bold design that makes this home stand out. Designed and built for life, it has recently been awarded a 5-Star Lifemark Rating. ‘Homes designed to the Lifemark Design Standards use space in the right place’, explains Geoff. Speaking of the Cummings’ home, he explains that, ‘the doors and corridors have been made a little wider than standard, and access in and around the house is level and spacious, so it’s easier to move around with mobility issues, move furniture or simply carry shopping inside. ‘Door handles, window latches and tapware around the home are lever-actioned, to make them easier to grip and use’, he continues, ‘while light switches and door handles are all aligned at the same height’. For Janet and Bernie, designing their home with safety, usability and adaptability in mind means their home is not only beautiful, says Bernie – ‘it’s that much easier to live in’. Fondly referring to their home as an amalgamation of their ideas, wants and needs, for Janet and Bernie it is everything they wanted it to be. ‘The hanger’ is a much-loved home, and will be for some time.